One of the classic effects, the Cut and Restored Rope trick never fails to please and can be done close up or on stage. The magician displays a length of rope and runs it through his hands. Stopping in the middle, he brings his hands together to form a loop and then produces a pair of scissors and cuts the rope in two. Declaring he will now make two ropes into one, he ties the two pieces into a knot and takes a bow. When the audience demands more, he wraps the rope around one hand and then unwraps it to show it is restored into one length. A special move allows the magician to cut the end and not the middle of the rope. Soft rope is best - magician’s rope if possible and about three feet long. A pair of scissors. No advance preparation is required. Starting the trick with the scissors in the right pocket makes sense for when they are discarded at the end. 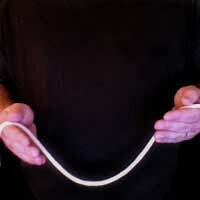 The Cut and Restored Rope is a staple in a magician’s arsenal of tricks and can be a great lead in to many other rope tricks. This trick appeals to young and old alike and can be done on stage or right before the eyes of an amazed audience. Magician holds the length of rope in his left hand, dangling it down to show its full length. Placing right hand near left, the magician runs the right hand along the length of the rope until he reaches the middle. The magician pinches the spot of the rope where he stopped with right thumb and forefinger. Reaching towards the left hand, the magician grabs the rope three or four inches below the end with the right forefinger and middle finger. He passes off the pinched end to the left hand and draws a loop of rope forward holding it with the right forefinger and middle finger. The magician cuts the loop with a pair of scissors and then lets the long end of the rope dangle. The magician ties a knot with the two upper ends and shows how the rope has been reattached thanks to the knot. With the scissors the magician trims off excess rope from the knot. Still holding the scissors in the right hand, the magician begins to wind the rope around the left hand. When he comes to the knot it will slide off, where he can conceal it in his right hand. The magician puts the scissors - and the knot - in his pocket and then unwinds the rope to show that it has been magically restored. Magician’s rope - soft rope with the “inner core” removed - is the best for this trick, but it can be done with a cotton clothes line or even thread, but rope is best. Practice the move where the false loop is formed over and over until it can be done without hesitation or hitches, as this is required to make the illusion believable.